Pictured here are Jeffrey M. Fried, President and CEO of Beebe Medical Center; Pam Coleman, Thrift Shop Manager; and Mike Clemmer, President of the Beebe Auxiliary, enjoying the festivities at the shop during a recent Lewes Chamber of Commerce event. Beebe’s Treasure Chest Thrift Shop was alive with laughter and lively conversation recently when members of the Lewes Chamber of Commerce held their monthly social mixer at the shop, joined by Board members from the Beebe Medical Center, the Beebe Auxiliary and the Beebe Foundation in recognizing the shop’s 5th anniversary. 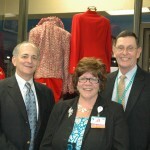 Beebe’s Treasure Chest Thrift Shop, located in the Midway Shopping Mall along Route 1 in Rehoboth Beach, has been a fundraising success for Beebe Medical Center Auxiliary. The shop is operated by the Beebe Auxiliary and staffed by nearly 50 Auxiliary volunteers who contribute thousands of hours annually to make the shop a success. The Thrift Shop opened for business in February 2007 in a single unit in the Midway Shopping Center. Mr. Clemmer recalled that many people wondered whether the little shop would succeed once the first load of donations was sold. Instead, the shop became so popular that eventually it expanded into the adjacent unit, and now has separate furnishings and clothing departments. There also are a variety of smaller items including kitchen utensils and appliances, dinnerware, art, books, decorator items and unexpected finds. The Shop has been an important source of income for the Auxiliary, which in recent years has given nearly $3 million to Beebe Medical Center from all of its many fundraising activities, as well as from donations. The Auxiliary celebrated its 75th anniversary in 2011. Caption: Pictured here are Jeffrey M. Fried, President and CEO of Beebe Medical Center, Pam Coleman, Thrift Shop Manager; and Mike Clemmer, President of the Beebe Auxiliary, enjoying the recent festivities at the shop during a recent Lewes Chamber of Commerce event.